Ploesti, Romania is one of the more infamous targets in WWII as well as one of the most dangerous. It was the third most heavily defended target in Europe, and the most heavily defended target outside of Germany. Ploesti is most often remembered for the disastrous first raid launched against it by the USAAF on August 1, 1943 - an event now known as "Black Sunday". 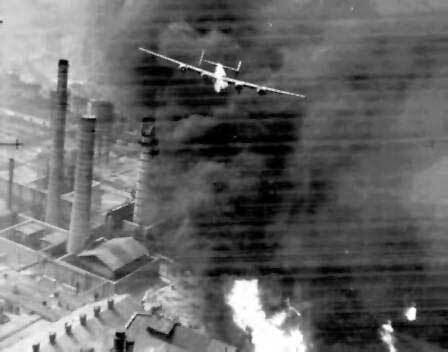 177 B-24 Liberators took off from their base in North Africa on a low level mission to bomb the refineries at Ploesti. Only 33 of the 177 aircraft returned in base in condition to fly again. 540 airmen lost their lives. It was, and continues to be, the worst loss ever suffered by the US air forces on a single mission. The refineries continued to operate at near full capacity following the raid. The enemy had commenced to repair Romanian oil refineries by "cannibalizing" damaged installations. It was, therefore, important to destroy all undamaged equipment in refineries which were temporarily or permanently out of production. The original target for the night was the Standard Oil Refinery, but this had been successfully attacked during the day by American Forces and at 1600 hours the attack was changed to Xenia. 63 Wellingtons from 231, 236, and 330 Wings, nine Liberators from 2 SAAF Wing, and six Halifaxes from 614 Squadron were dispatched, but twenty-two returned early, three landed away, one jettisoned and three Wellingtons are missing. 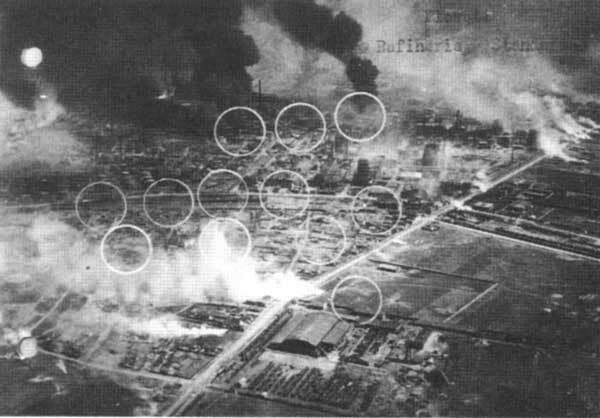 The remaining aircraft reached the target but the Ploesti defences were very active, the smoke screen being especially effective and no aircraft were able to pinpoint the target. TI's were dropped (on H2S) and most aircraft bombed on them, but no results were observed. A 4000 lb bomb was dropped on the marshalling yards, causing a large explosion and a column of smoke. 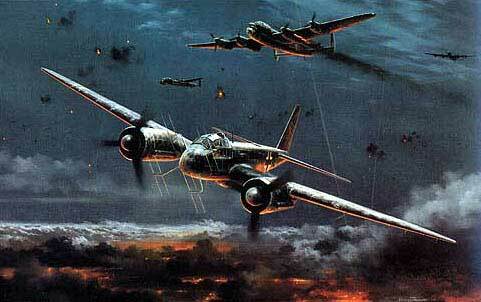 Fighters were active, including Ju 88 and Me 109 and two short encounters took place without result. 86 tons of bombs and 845,000 nickels were dropped. The aircraft missing were "X-X Ray" and "Y-Yoke" of 40 Squadron, captains Sergeants Francis and Patterson and "Q-Queenie" of 70 Squadron, captain Warrant Officer Bridges. This last aircraft (Q-Queenie) was attacked by fighters near Slatina and sustained damage to the starboard engine. Course was set for Turkey and the Bosphorus reached, flying mainly on one engine. Here, in spite of navigation lights and the flashing of "SOS", "England", "British" etc on the downward recognition light, the aircraft was greeted by intense and very accurate flak. After some time had elapsed lights appeared at an airfield but intense AA practice was indulged in by shipping. On landing the aircraft caught fire and burnt out, but the crew were uninjured. The Pathfinder Force of 614 Squadron strove to make their drop at 2300 hours and the rest to blitz as close to that time as possible. The last bomber was to deliver its load at 2315 hours. 614 Squadron dropped twenty green TI's, but, as was typical at Ploesti, the thick smoke screen generated by the defending forces soon obscured the markers. A violent explosion and large fire were caused by the bombs dropped with the first TI's and several other sticks of bombs were seen to burst around the markers. 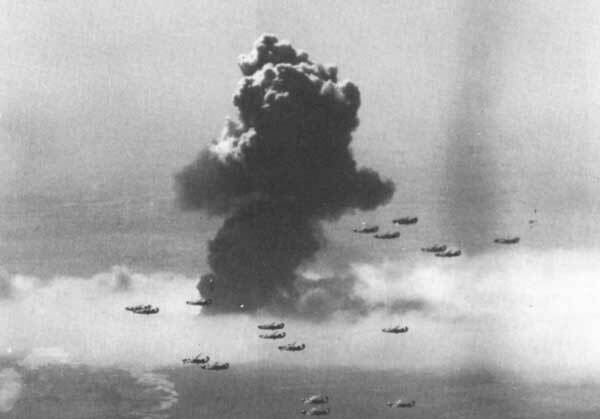 The Halifaxes were operating at heights from 16,500 to 18,000 feet and dropped nearly eight tons of bombs. The white haze on the ground is the famous smoke screen created by the troops defending the refineries. Of the ten Liberators 2 SAAF Wing launched, only five were able to attack the primary target, dropping fifteen tons of 500 pound bombs from 7000 up to 18,000 feet. 231 wing's night began poorly when two Wellingtons failed to take off, five from 37 Squadron and two from 70 Squadron returned early leaving fourteen to attack the refinery. The Wing thought the green TI's were late, but all were able to concentrate their delivery on them and two explosions were observed through the smoke. Twenty one tons of 500 pound bombs were dropped from between 13,500 and 15,800 feet, as well as 260,000 nickels. MacIsaac, again flying in Maurice Lihous former Wellington LP502 "H", dropped six 500 pound bombs at 2310 hours on the green TI's from 14,000 feet on a heading of 90 degrees. He reported seeing fires already burning to the east and south-east of the target which must have been started by the daylight attack. 236 wing's force was down to fourteen when the target was reached and two were missing. One Wellington was late and bombed on ETA in a heavily defended area, the green TI's being no longer visible. The rest bombed on the green TI's but did not observe any results. Crews saw the large explosion reported by 614 Squadron, commenting that the smoke from the resulting fire had risen to 3000 feet. The ORB noted that poor quality aiming point photos show the smoke screen in operation and the green markers burning in a built up area. 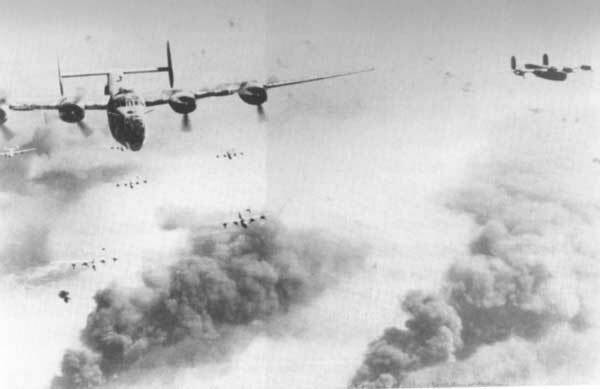 Twenty tons of bombs were dropped from between 12,500 and 15,400 feet along with 285,000 nickels. Typically for this target, not much is visible other than the thick smoke screen. Thirteen of 330 wing's original twenty aircraft completed their attacks. These crews also thought the green TI's were dropped late. Ten bombed on the green TI's, two by dead-reckoning, and one visually. Wellington "Z" of 150 Squadron dropped a 4000 pound bomb which exploded at 2304 hours in the adjacent railway yards causing a violent explosion. A fire was started and oily black smoke rose to 7000 feet. Altogether the wing dropped two 4000 pound and a mix of 500 and 250 pound bombs for a total of over 23 tons plus 300,000 nickels from 13,500 to 16,800 feet. Three 500 pound bombs were hung-up and brought back to base. The weather was cloudless but there was "a lot of ground haze" en route. Over the target area the flak was intense as usual. 614 Squadron described it as, "active and sometimes very accurate heavy and light flak. Up to 60 searchlights." The SAAF Wing counted another ten searchlights and one Liberator was coned for five minutes. Another was holed by flak splinters. The Wellington Wings estimates of searchlights varied but some were as high as 100. 231 Wing felt the flak was mainly directed into the searchlight cones. 300 Wing crew reported an unusual phenomenon: at 2325 hours when all the attacking aircraft were clear of the target area all the searchlights were suddenly directed vertically. 236 Wing noted heavy caliber flak from the Craiova area. At 2215 hours, about 130 kilometers south-west of Nis a SAAF Liberator saw an aircraft on fire, hit the ground and explode. Two minutes later a 236 Wing Wellington crew reported a similar incident - an aircraft crashed into a hillside and burst into flames. These sightings may have been the crash of 40 Squadrons Wellington HF476 "X", captained by Sgt. D. J. Francis. No trace of this crew was ever found and all five are listed as having no known graves. ...by a Ju 88 from the starboard beam on run into target, two other unidentified enemy aircraft in the vicinity at the same time opened fire and evasive corkscrewing action taken - aircraft not hit. At 2304 hours enemy aircraft attacked as leaving target area; at 2310 hours at 400 meters range the mid-upper gunner fired a two second burst at enemy aircraft on the port bow. Red light in nose of the enemy aircraft was extinguished - no hits claimed and enemy broke off attack and disappeared. "Moonhunter" - a painting of a Ju-88 radar guided night-fighter over a target. At the same time, 2304 hours, "R" of 70 Squadron's crew noticed a single parachute falling in a cone of searchlights in the target area. A minute later a 614 Squadron crew saw a Wellington coned over the target. Eleven minutes later a Halifax crew saw five other unidentified aircraft, probably other bombers milling about as they came away from Ploesti. At the same time the observant crew of 70 Squadrons "R" noticed red fighter flares burning in two areas, one ahead near to the Danube and one in the target area. They also watched an aircraft coned by searchlights catch fire at about 10,000 feet and fall in flames. A 330 Wing pilot saw the same incident rating the height at 13,000 feet. 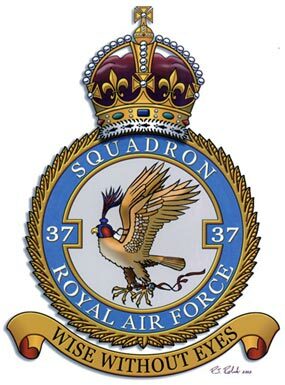 What was most likely the final moments of Wellington LP307 "W" of 40 Squadron was seen at 2319 and 2320 hours by two crews from 236 and 330 Wing. Air to air firing was observed, after which a Wellington caught fire and fell to the ground. A possibly connected incident followed immediately. A Halifax crew noted firing from a 6-gun flak position somewhere just north of Ploesti. They saw the shells burst after which an unidentified aircraft was seen to crash and explode on hitting the ground. Two other crews from 614 Squadron made the same sighting. It seems likely that "W", after being crippled by a fighter, was finally knocked down by one of the Ploesti flak batteries. On our first run over the target we had very heavy flak and broke off the run to try again. This time we were caught and coned - even blue-lighted. Fortunately the flak was behind us but very close and we had some scattered hits - we thought we were finished. By this time the enemy had the target smoke-screened and on our third run in I dropped the four green TI's and three 1000 pound bombs using the H2S radar. This was our first time to use this method and we were quite successful. The explanation we had for not being seriously damaged was classed as human error - on the enemy's part - in transferring settings from the searchlights to the guns. On this trip we had a Mid-Upper Gunner (MUG) who had been posted to 614 Squadron from a Marauder day-bomber unit. (Most of our aircraft were not fitted with mid-upper turrets, so MUG's were drawn from the hat, so to speak). Our "temp" MUG was used to daylight ops and .50 inch Brownings. Night-bombing and our .303 inch Brownings were new to him. He also, I recall, had a particularly high-pitched and piercing voice. Anyway, we were running in to the target and were all in fairly high pitch of apprehension due to all that was going on around us. Suddenly, the MUG shouted "Fighter, fighter starboard - go!" and at once I pulled a hard bank and rudder to starboard and down in the first leg of a corkscrew. As we went down to the right the MUG opened fire and I could see his tracer arcing out towards one of the decoys. The tracer was falling well short of the enemy aircraft. I told him to cease firing and, simultaneously, our two starboard propellers ran away. I do not know what revs they reached, but it was well above the 3,000 rpm which was the maximum. By heaving on the stick and pointing the nose skyward we were able to bring them back under control and we resumed our run in to the target. Shortly after this, the MUG again shouted over the intercom "Fighter, fighter, port - go!" There was no time to question him, so I had to go into a corkscrew to port, hoping like hell that the propellers would not repeat their performance. He opened fire again, this time at a light, probably a fire, on the ground. While he was spraying tracer all over the place, my own rear-gunner - Dickie Billen - who was a permanent and valued member of my crew shouted "Fighter, fighter, starboard - go!" and immediately opened fire on a Ju-88 which had presumably been attracted to the firework display which our "temp" MUG had provided. By this time I was a bit hyper-active and I reefed the aircraft into a tight turn to starboard, such that Dickie could not keep the guns on the Ju-88. Happily the fighter could not keep his guns on us either and, apart from a 20mm shell, which hit just below the rear turret but did not explode, we emerged unscathed if thoroughly terrified. We managed to complete our bombing run and had no more frights on the way home. As a postscript, I have to report, sadly, that the MUG in question, with all his crew, disappeared a few nights later. The 17th dawned and we found ourselves in Operation Orders for that night and Ploesti was to be our first trip as a "sprog" crew. There were many suggestions such as "when you have bombed, get down on the deck as far as the Danube." Remarks of fun like "fancy sending learners out for so long!" This was all in good fun but some of it was rather lost on us because we had no idea what the unknown would hold. We took off at 1924 hours and arrived back seven and a half hours later, having been coned by radar-controlled searchlights, luckily not set on by fighters or flak, although there were plenty of fireworks. The bombload was only six 500 lb HE to make room in one bomb bay for the overload tank. This was to be used for one hour after take off on main tanks. Climbing over the mountains on course for the Danube, we suddenly lost an engine and the aircraft turned through 90 degrees. The skipper realized that the overload had run out and switched back to main. Luckily the engine picked up. This all took place in a spell of 30-40 seconds I should think, but it seemed like an eternity. The ground crew were very pleased the next morning as overload tanks were very difficult to handle when they still contained fuel. A late afternoon briefing: the USAAF had warmed things up during the day and our job was to keep up the attack. Take off was at 1930 hours. The nearer we got the more flak we met. There were many fires still burning from the daylight attack and the target area was hazy. We used a refinery tank-farm as our AP, but I could not observe our own bomb bursts. The load was six 500 lb GP. The photo flash did not work. We sighted no fighters, but there were some fighter flares. All round, my excursions to Ploesti were not really notable, except for being young and innocent enough to excuse flying around among searchlights, flak and fighters while we looked for our target. Now I shudder - then we laughed and had another drink! It was on this trip that we had a dust up with an Me-109 - almost collided head on - another three or four feet lower and he would have taken our port wing off. How close can you go? He came back and our rear gunner gave him a short burst at which point he lost interest. At our briefing we were told that the target would be Xenia Oil Refinery at Ploesti and we could see the red marker tape pinned on the wall. Pathfinder markers would give us course changes and mark the target area. The enemy had intensified their defense around the whole Ploesti area. Night fighter bases had been increased in Hungary and some of the best squadrons had been sent from Germany at the expense of the defense of their large cities. After briefing we were taken to our aircraft. I was Rear Gunner in "J" Liberator which took Walt Disney's cricket, Jiminey, as it's mascot. After a signal from an Aldis lamp we set off down the metal stripped runway and climbed into the rapidly darkening sky. Our first course was set and we crossed the Adriatic Sea at about 5000 feet. I tested my guns, dropped a few marker flares and took some drift readings to assist the navigator in checking the wind speed. The course had been set to avoid known enemy night-fighter bases and concentrations of flak. We altered course at the first Pathfinder marker. These were usually a colored flare and were very clear. We passed Lake Scutari in Yugoslavia, climbed over the Yugoslav mountains and crossed the corner of Bulgaria and on into Romania, where we dropped down to a lower height as we approached Xenia. I saw my first night fighter flares. However, we ran into ten-tenths cloud and felt safe for a while. I had my thick armor-plated glass removed from the turret so that my vision was excellent. The cold was intense even with my electric flying suit and boots, but it was vital for me to have clear vision especially at night. 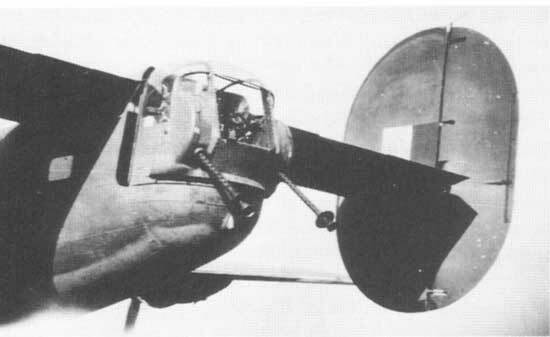 A good view of the rear turret of a 34 Squadron B-24 Liberator. Note the central perspex panel removed to improve vision. We had dropped well below the cloud ceiling as we were approaching the target area when, in the glare of a very close flare, I caught a glimpse of a twin-engined night fighter, well to port and slightly below our flight path. I alerted the pilot and he took evasive action, a corkscrew roll, and I opened fire. The attack was not pressed home and we resumed our course. By now the first ring of searchlights was probing the sky with the inevitable blue master light and up came the heavy flak. It was well below out aircraft: one could clearly see the star-like bright shower of shrapnel around the black puffs of smoke in the searchlight beams. I felt sorry for the Wellington bombers below us. We seemed to fly out of the first ring of flak but not out of the searchlights. The place seemed to be alight with them. I heard the navigator warn the bomb aimer that we were close to the target markers and to take over. The bomb aimer now guided the pilot on the final bomb run, which was a testing time for the rest of the crew. It always seemed to take ages before the call "bombs gone" came over the intercom and then we felt the sudden lift of the aircraft after shedding its load. At the same time the searchlights below were trying to cone us in their beams. The navigator gave the pilot a course for home. The anti aircraft guns now found our height and the black puffs in the searchlight beams with the star-like flicks of shrapnel were uncomfortable close as we climbed on course homeward bound. A blue searchlight found us and immediately we were coned by more searchlights. The pilot, Major Des Marais, dropped his port wing and went into a shallow dive. I thought he was going to roll the aircraft. We twisted and turned, but it seemed as though we would never lose the lights - and by now we had lost a lot of height. All of a sudden we were out of the cone and the anti-aircraft shells. A new course was set for Celone and home with high hopes. But that was not to be. On the fringe of the target area I saw two fighters. I immediately warned the MUG and the beam gunner to concentrate their search below the aircraft and not to look at the searchlights. The fighter tactics were for the top aircraft to drop the fighter flares and the lower one to attack the bomber brilliantly silhouetted against the bright light of the flares. Although I depressed my guns to their limit, my downward vision was limited especially if the enemy aircraft came up close and below us. Then, mercifully, we started to fly into ten-tenths cloud as we approached the Yugoslav mountains. After that there were no more night fighters and it was a steady flight back to base, arriving six hours after take off. Night-bomber damage. Smoke palls rise above a refinery at Ploesti. The white smoke wisps are the remains of the defending smoke pots. There were many sightings of aircraft believed to be night fighters on the homeward leg but no serious engagements took place. At 2335 hours a 330 Wing Wellington, flying at 11,000 feet between Tirgoviste and the Danube was overtaken by a Ju-88 which passed 500 feet beneath from the starboard quarter to port. At 0015 hours, while south of Turnu Severin, another 330 Wing bomber was approached by a Ju-88. At 19,000 feet - to clear the Yugoslav mountains ahead - a Ju-88 climbed to intercept from the starboard and opened fire at 300 meters. No hits were scored and the Ju-88 "withdrew". At the same time another Wellington, at 10,000 feet, reported an Me-109 flying on a parallel course at the same height, 600 to 800 meters away. After a while it turned away. At 0029 hours while south-east of Belgrade and flying at 8000 feet another crew watched an unidentified aircraft showing a white light to starboard at their height. There was no engagement. At 0250 hours Flight Sergeant MacIsaac and his crew landed safely at Tortorella. ROMANIAN LIVES CAN STILL BE SAVED, IF YOU KNOW HOW TO IMPOSE AN END TO THIS KIND OF CAMOUFLAGE. Also the fog of the German lies, made up specially to keep Romania at war, cannot prevent the United Nations smashing any resistance on Romanian land. Hundreds of thousands of Romanian lives can still be saved, if you can impose the ending of the policy of sacrifice of Romania for Germany. THE FATE OF YOUR COUNTRY LIES IN YOUR HANDS. REMOVE THE GERMAN FOG. A "nickel" dropped on Ploesti - translation at right. 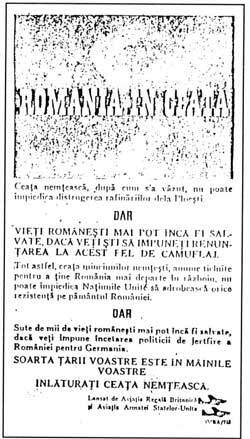 Most leaflets dropped over Romania mentioned the German "smoke-screen" defenses around Ploesti as being responsible for bombs missing their targets and hitting residential areas. The solution to this problem proposed by the leaflets was usually for the Romanians to destroy the "fog" defense system.